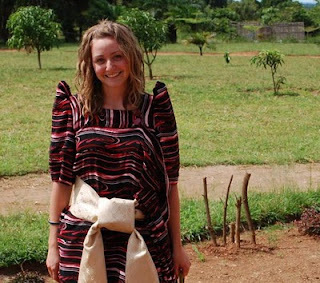 As a high school graduate who didn’t think she was “smart” enough to go to university, Kara Dooley hit the road and spent three years travelling and working abroad. As her experiences grew, so did her confidence, and Kara decided she wanted to go to college to study sign language. She took night classes at Vancouver Community College before enrolling in VCC’s Deaf Studies program in 2007. She also started volunteering at the Union Gospel Mission Women’s Drop In Centre. Kara soon developed an interest in social justice and working with marginalized people, which led her to the Community Social Service Worker Program at Douglas College. After completing the Community Social Service Worker Program last year, including a practicum in Uganda, Kara is now living in Perth, Australia, where she is a case worker for a psychosocial rehabilitation program. She credits her practicum in Uganda for helping her land the job―as well as being asked to speak at the 2010 Joint World Conference on Social Work and Social Development in Hong Kong, in June. 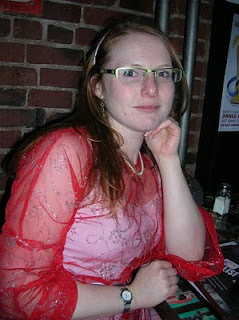 At the conference, Kara won the “Best Abstract-Practitioner” award. Next on Kara’s checklist: go to university and get a degree in social work. The Program of Sign Language Interpretation at Douglas College has received a prestigious award with a prodigious name: the 2010 Video Relay Service Interpreter Education Program Award of Excellence. This is the first time that the North America-wide award has been presented to a Canadian college or university. The annual award, presented by Sorenson Communications, an American company that provides video relay service for deaf and hard-of-hearing individuals who use sign language to communicate, is given to an interpreter education program (IEP) that is making a meaningful contribution by expanding curriculum and responding to the ever-increasing demand for interpreters. Find out more about the award―and discover what on earth "video relay service" means―here. Update! October 19: deafbc.ca and tmc.net congratulate Douglas on its win. When Greg Halseth came to Douglas College in 1978, he didn’t have a clear idea of what he wanted to pursue. But during his first year he developed a strong interest in both community development, and the relationships between communities and the natural landscapes in which they are set. At the end of that year he decided to major in Geography and then took courses to fulfill the requirements to transfer to UBC. After graduation, Greg spent four years as a regional planner with the Regional District of Fraser-Cheam (now part of the Regional District of the Fraser Valley). 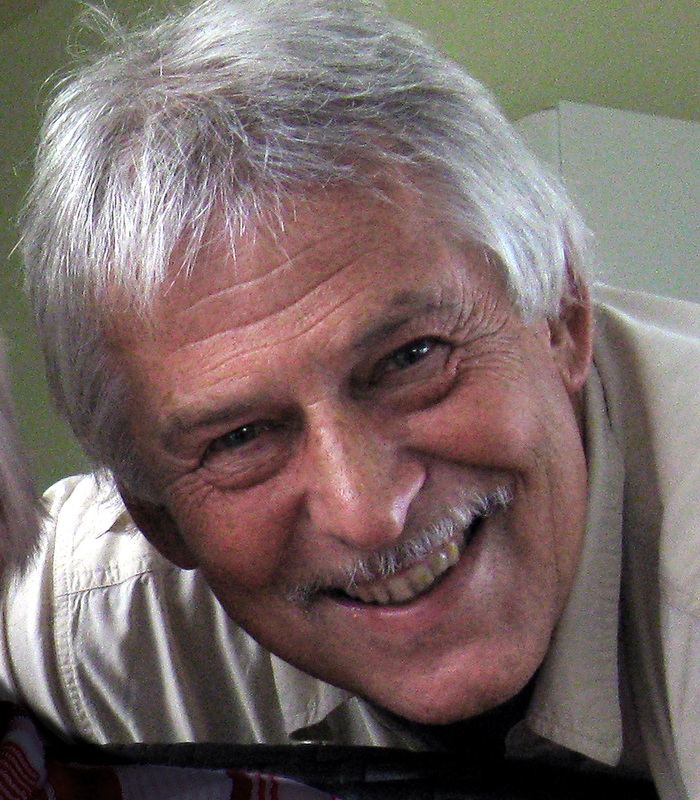 He then returned to school to do his MA and PhD at Queen’s University in Kingston, Ontario, before returning to BC to do post-doctoral studies in Geography at SFU and with the university’s Community Economic Development Centre. 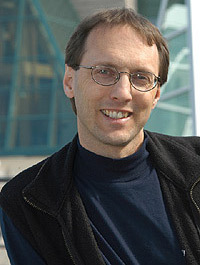 Today, Greg is a professor in the Geography Program at the University of Northern British Columbia, in Prince George, where he’s been since 1994. He’s also the Canada Research Chair in Rural and Small Town Studies as well as the Director of UNBC’s Community Development Institute. Sitting in on a good history class can be akin to sitting around a fire and being regaled with stories of days long past. The best history teachers are also skilled storytellers, and Rhoda Friedrichs is no exception. In Friedrichs’ World History 1900-1945 (History 1103) there was no cozy bonfire (just fluorescent lights, alas), but the events that Friedrichs was relating were as fascinating and illuminating as they were historically significant. On this day, Friedrichs was talking about the Russian Revolution. History was one of my strong subjects in school―I had a sharp memory and a head for facts and dates―but in the years since I graduated it seems I forgot almost everything I ever learned about the Russian Revolution. Dates such as 1917 and names like Rasputin and Petrograd were still familiar, but I couldn’t remember how they all fit together. It’s embarrassing to admit, but in my head the true facts of Rasputin’s death had been supplanted with the non-facts offered in the eponymous Boney M song (Rasputin was in fact not shot till dead, but forcibly drowned), and Petrograd sounded more like a Soviet-era gas station than the name given to St. Petersburg in 1914 (as the original name was deemed too German). I also learned that my grandparents―Russian Mennonites who’d fled the Soviet Union in the 1920s―could not have been pardoned by Tsarina Alexandra, as my mother had told me―as she had been executed in 1918 (the Tsarina, not my mother). But studying history is about far more than setting the record straight. After all, we are the sum of our histories―personal, national and global. Everything that has come before us has got us to where we are today, and will have a hand in determining where we go from here. Learn more about Douglas's History program. October is breast cancer awareness month, and the Student Ambassadors are raising money for research with a costume-making photo booth activity this Thursday at David Lam Campus. As part of its "Halloween Dooms Day" celebrations, the Student Ambassadors will also present a bake sale, scavenger hunt and the chance to win prizes such as cafeteria lunch cards and an iTunes gift card. 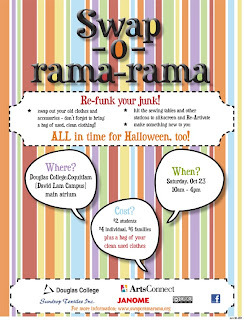 At the New Westminster Campus, look out for a costume contest, a colouring contest with a twist, scavenger hunt, the chance to make a jack-o-lantern―blindfolded no less―and a performance by the HipHop Club. Don your fanciest frippery and get ready to party! 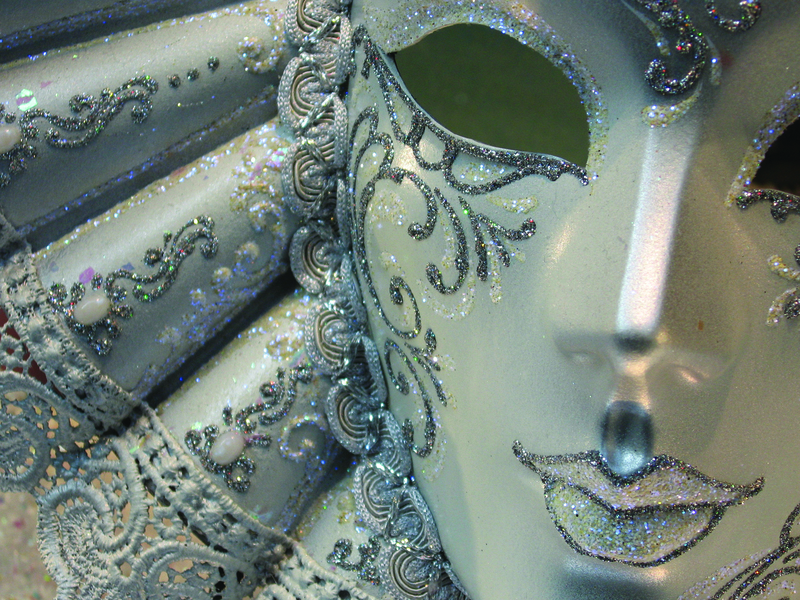 On October 30, we're celebrating Douglas College's 40th anniversary and the Douglas College Foundation's 25th anniversary with a Masque Royale, an opulent, Renaissance-style masked ball. Everyone's invited! This fundraising extravaganza aims to raise $100,000 to help students in need pay for tuition and books. The gala includes a reception, dinner, dancing, plus a feast for the eyes and ears from musicians, circus performers, artists and singers.There will also be live and silent auctions, and the chance to win great prizes such as a watercolour of Venice (painted during the gala, no less), a trip to a fishing lodge and fine jewellery. Tickets are $125 (includes a $25 tax receipt); tables for eight people are $900. 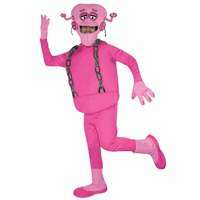 Guests are encouraged to come in formal attire or costume. Bring your own mask or pick one up at the party in exchange for a donation. The Masque Royale takes place Saturday, October 30 at the New Westminster Campus. To order tickets, call 604-777-6176 or email masqueroyale@douglascollege.ca. 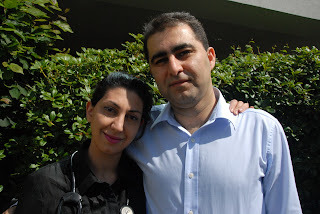 Like many new immigrants, Mahshid G. and Hooman S. faced their share of challenges when they came to Canada from Iran in 2007. They had no family or friends in their new country. Despite their education (both are medical doctors), they had no job prospects. At the same time, Mahshid was pregnant with the couple’s son. A lot has changed since then. Shortly after coming to Canada, they discovered the Training Group at Douglas College Skills Connect for Immigrants Program, which helps new Canadians find employment in their field of expertise. Today, they are among 18 new Canadians who are starting medical residencies in B.C. through the Ministry of Health’s International Medical Graduates of British Columbia Program. Hooman heads into a five year orthopedic surgery residency, while Mahshid is working in family medicine for two years. The couple say they understand the difficulties many other skilled immigrants face when it comes to finding appropriate employment, but recognize that many of these challenges come with the territory. More than 60 Douglas students came out for the 1st men’s basketball intramural tournament October 15. Six teams competed to determine who would take home the 5 on 5 trophy. Los Torros came out on top, with Ballers Unite taking a close second. It was a round robin format, with every team playing 5 matches in total. Prizes included a trophy, intramural championship shirts, water bottles and a gift certificate to Boston Pizza. Big thanks go out to the Rec Squad volunteers (Kristi Wilson, Cindy Lawson, Sunera, Mashor, Yaw Bio-Twum, Kate Britton, Thayna and Morgan Wasiliew, Kevin Gunawan and Parmdeep Gahunia) for helping organize the tournament. It's been a long road for Phillip Choi. In 1982 he came to Canada with little English - today, he's the Associate Chair of the Department of Chemical and Materials Engineering at the University of Alberta. And it's largely thanks to Douglas College, says Choi. "My high school marks from Hong Kong were not high enough to get me into any Canadian universities and no high schools in the greater Vancouver area would accept me to repeat grade 12 as I was over 19. Douglas College was my only hope," says Choi. It turned out he was a fast learner. It took only one year of English as a Second Language and University Transfer courses in General Studies at Douglas until Choi was ready to tackle university. "The teachers really know how to teach ESL. They didn't only correct my writing, but pointed out the differences between Chinese and English grammar that caused the majority of my errors. "For example, in Chinese there are no countable nouns. So one would write `I have two book' in Chinese rather than `I have two books,'" says Choi. His teachers suggested Choi underline all the nouns when writing and think about whether they could be counted or not determine if they needed an 's' added. "I am still practicing this trick today," says Choi. Choi went on to complete his BSc in Chemical Engineering at the University of BC, then his Master's and PhD (Waterloo). He spent a couple years working as a research engineer in the mid '90s before taking a job as an assistant professor at the University of Alberta. He was promoted to the rank of professor three years ago and was named associate chair in 2008. Choi says he never would have imagined teaching as a career before he came to Douglas. 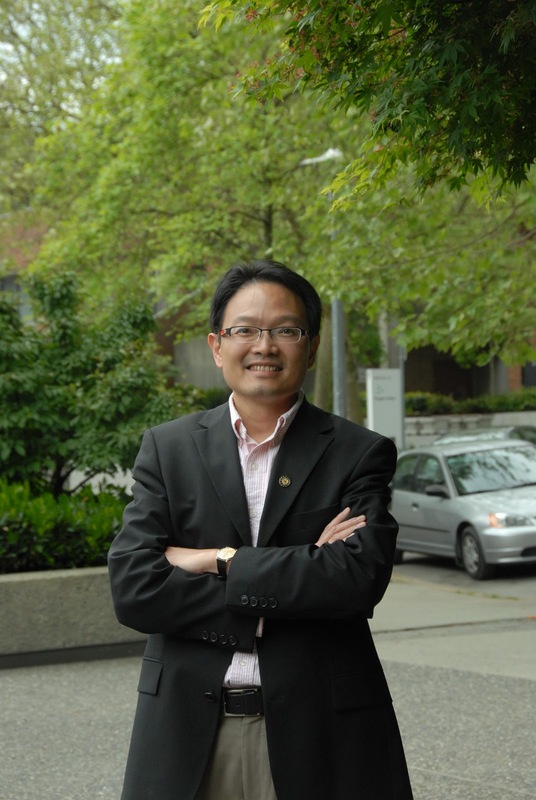 "One major reason that I chose to have an academic career is to help students develop their potential since I had excellent education here in Canada, at Douglas College in particular," says Choi. 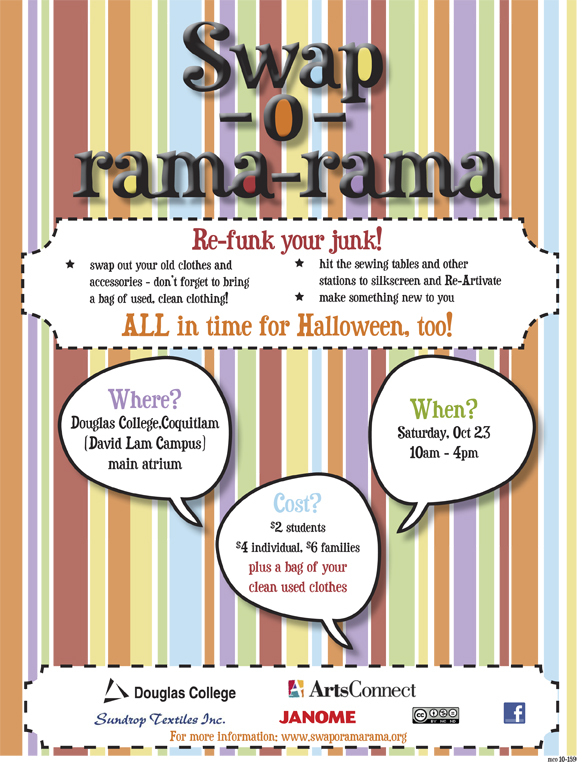 Calling all fashionistas, vintage vixens, cheap chic aficionados and DIY junkies: Swap-O-Rama-Rama―the coolest clothing swap on the planet―is coming to Douglas October 23. The concept is simple: bring a bag of clean, pre-loved clothing you no longer wear, throw it onto the collective pile, and and dive in to find something new (to you) and fabulous. Take as much or as little as you like―it's all free to a good closet. If you want to customize your new threads, head over to the sewing machines, paint centres and silk screening stations, where local artists will show you how to modify, repair, embroider, stencil or otherwise embellish. Be there or be bare. Kelly Christie decided to attend Douglas College to begin a career in the field of medicine. After graduating from the Home Support/Resident Care Attendant program in 2005, she was accepted into the Psychiatric Nursing program in September 2005. 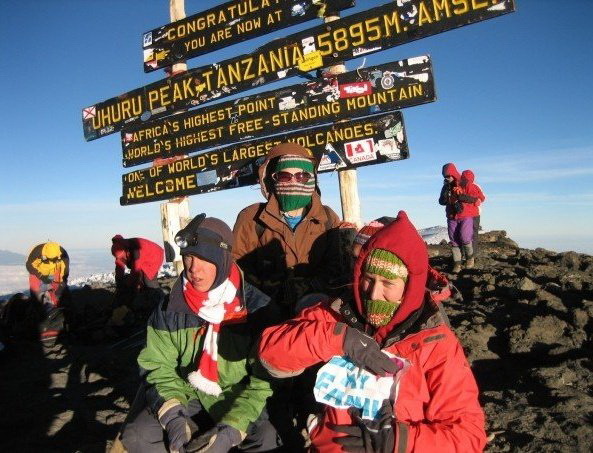 Between semesters, Kelly volunteered in Africa, assisting with building a school, teaching English and climbing Mt. Kilimanjaro. Upon graduation in 2008, she was awarded the Diana Gunderson Memorial Award from Douglas College "for outstanding caring compassion in the clinical setting" and obtained a job at St. Paul's Hospital, working in the Eating Disorders inpatient unit and the acute psychiatric assessment and treatment unit. 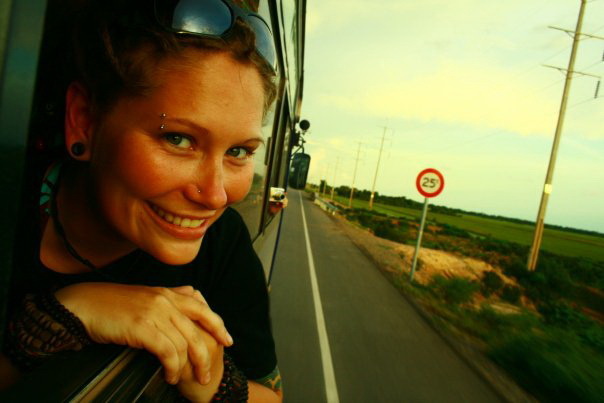 After a year there, she spent a year in Asia, volunteering at an orphanage for disabled children in Nepal, working with Burmese refugee children on the Thai side of the Thai-Burma border, trekking to the Mount Everest base camp and climbing Mt. Kinabalu in Borneo. Upon returning to BC, Kelly returned to her work at St. Paul's. She recently spoke at the RPN World congress on the importance of mental health promotion on the global arena. This October, she is the keynote speaker at CRPN Alberta’s annual conference. Whether you're an aspiring rock guitarist or future diva who dreams of one day singing at the Met, as a Music student at Douglas you are required to take this third semester class, which hones the development of aural and sight singing skills. Ollen pointed out that most of the students in the class were in fact instrumentalists and not vocal majors, but that they needed to learn how to use their voice "as a tool." Ollen says the voice is the one instrument that musicians always carry with them, and it is a convenient means of communicating musical ideas. The students warmed up by practising sight singing through hand signs, a series of movements that illustrate the "solfege" syllables (do re mi fa so la ti do) and represent pitch. Next, in a battle of the sexes, the men were pitted against the women during "Quick Reaction" rhythm drills, where students had to chant the right rhythm patterns as Ollen pointed to them on the white board. But my favourite part was during the introduction to chromaticism, where the students were invited to sing along to “La Habanera,” from Carmen, and then figure out the solfege syllables by ear. I won't pretend I understand the meaning of "chromaticism” (not even after looking it up in the dictionary), but I'm a sucker for opera, and loved hearing the strains of the soprano’s voice as they filled the room, and was even able to somewhat follow along. As a second-year course in the University-transfer Bachelor of Music program, Ear Training & Sight Singing III is for advanced students of Music. But even I, who stopped my music studies in junior high, could appreciate, and even follow, many of the concepts Ollen was teaching. Find out more about Douglas College's Music Program here. Talk about making a difference: yesterday, 15 young Canadians from across the country left for Africa to work in hospitals, libraries and aid centres as part of Douglas College’s ongoing Uganda Project. Aged 30 and under, the participants will be away for five months as they complete paid internships at institutions such as the Masaka Regional Referral Hospital, where they’ll be working with patients with HIV/AIDS, mental illnesses and other health conditions. The program is funded by the Canadian International Development Agency (CIDA). 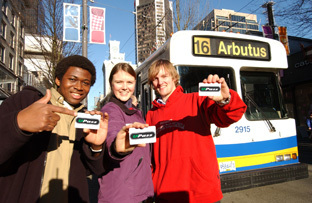 Douglas College partnered with both CIDA and the country of Uganda to make the project a go. The group includes two Douglas College grads: Brent Harris, who graduated from the Marketing and Management Diploma program in January; and Laura Richard, a graduate of the Community Social Service Worker program in 2009. The College has established long-term commitments to Uganda. In 2006 it launched the Uganda Endowment Fund to provide funding for social service agencies. As well, since 2006 close to two dozen students from the Community Social Service Worker Program, and more recently from the Co-Occurring Disorders, Early Childhood Education, and Dental Assisting programs, have travelled to the African nation for 10-week field learning practicum placements with various agencies as part of their education. For more info on the Uganda Project, click here. Bedlam is a 12 ½ minute documentary that offers an intimate glimpse into asylum life at "Essondale"―now known as Riverview Hospital―in Coquitlam. Produced by Douglas Criminology instructor Heidi Currie and directed by independent filmmaker lisa g, Bedlam is the story of Kay Clayton, a health care worker who started working in the asylum's women's ward in 1945―in an era when medications were virtually non-existent. "It’s pre-medication asylum care," explains Currie. "There’s a real din, the institution is loud and crowded and it's controlled environmentally; it’s not controlled by medication the way it is now." Bedlam combines never-before-seen archival film and photography with present-day super 8 footage of Essondale. "We were able to incorporate archival film from the Riverview Hospital Historical Society from as early as the 1930s," Currie says. "It's a unique academic contribution to documenting the topic." 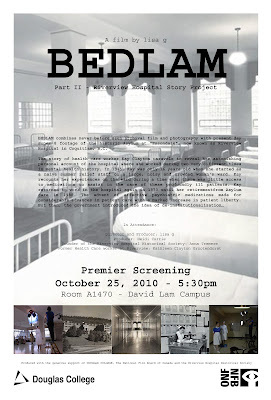 Bedlam premieres October 25, 5:30pm in the Lecture Theatre (A1470) at David Lam Campus. Currie and lisa g will be in attendance, along with Kathleen (Kay) Clayton Grootendorst and Anna Tremere, Founder of the Riverview Hospital Historical Society. Before Douglas College, Lisa Neilson was an 18 year-old single mother struggling to start a new life in Burnaby after a life on the streets. After successfully completing the Health Care Support Worker program, Lisa realized she would be doing herself a serious injustice if she did not continue her education. She is currently enrolled in the Criminology Diploma program and will graduate in January of 2011. In addition to her schooling, Lisa is in her fourth year as a peer-counsellor for street entrenched youth where much of her education at Douglas College very often comes in handy. John Belshaw grew up in Burnaby and attended Cariboo Hill High School, graduating in 1975. Although he very much wanted to go to UBC or SFU, his grades were "far from impressive," as he puts it. "I might have snuck under the wire, but I really lacked the confidence to succeed at university," John says. "My father, who was a single parent, encouraged and valued education but there wasn't a strong post-secondary tradition in our family. University was a place to which other people's kids went." John felt that a year at Douglas College would help reveal whether he could make it in a post secondary environment - and it did. Following his success at Douglas, John transferred to UBC where he completed his B.A. before heading to SFU and a Masters degree, and then on to the London School of Economics, where he completed a Ph.D. Following his passion for teaching in a student-centered, college environment, John accepted an appointment at Cariboo College in 1989 moving to his current position as Associate Vice President for Education at North Island College in 2006. 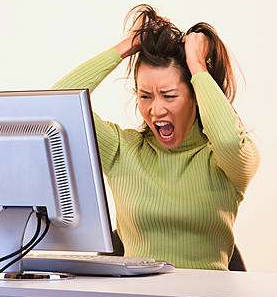 If the thought of writing a term paper makes you want to jump off the nearest building, quash that urge and head over to the library instead. Starting tomorrow, the libraries at both the New Westminster and David Lam campuses open their writing help desks to students who want to improve their course writing. We know it's easy to quit smoking (hey―you've done it dozens of times). But if you're looking to kick the habit once and for all, join Dr. Fred Bass, Medical Director of the BC Doctors’ Stop Smoking Program, for an informative session on how to control your inner alligator―the primitive part of your brain that craves nicotine. For more information, see bcmj.org/special-feature-training-inner-alligator. 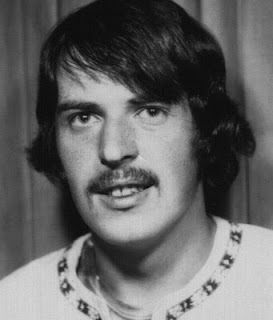 September 1970, I am 23 years old and on my daily afternoon hike to Cariboo Hill School, a good half hour from my room in Burnaby. Why am I heading there? Douglas College’s very first term of operation – and my life as an academic student - started without a campus! Out in New West at 8th and McBride there’s isn’t anything remotely resembling a place of learning! Some public school apparently has to pitch in. Is this what I came to Vancouver for, and to Canada for that matter? 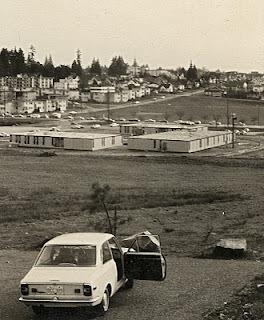 The New Westminster "campus" is the early 70's. Back in the summer of ´69 I said farewell to my native Germany, burdened with a messed up school "career", but with a technical trade to my credit. Working in Edmonton, night courses in English and other subjects, surviving -54 (°F), then word of future Douglas College even reached the Prairies. Soon I was off to longed-for Vancouver, application, friendly staff, all new in their roles, mature entry, no hassles. Am I dreaming? Finally, the chance to turn my life around! Literature, Philosophy, maybe Psychology, who knows. So, as soon as the Cariboo-kids were out, our college day started. Classes were shortened in order to cram the whole schedule in. At first the whole situation felt like a let-down, but soon a very special spirit emanated, the Indian summer, late afternoons, twilight-times, all these new faces, hard to tell who was student, who was staff. Everyone wanted to get to know everybody else. Never was it easier to talk to everyone you wanted. There were no veterans, no blasé seniors, no profs past their prime... Sure: there were some straights, but far more ”freaks”, it was year one after Woodstock! What followed were two years of serious study and a lot of fun and inspiration. Many names – students and faculty - still stick out in memory. Faces and situations drift by: There are Joe Kowalski’s introverted yet penetrating monologues on the supreme importance of understanding history. And Charles Marxer’s structured and lucid approach to Philosophy, he liked my notion that the universe is a work of art (an idea I had picked up somewhere). Ulrich Schaffer, the German poet, was champion of European literature, backed by quick-witted Wendy Terell and cosmopolitan Sabine Mabardi. Anthropologist Dave Jongeward gave fascinating accounts on Navaho religious practice and rainmaking. The McAslan-couple spiced their Art History lectures with literally hundreds of slides from around the world. There was the environmental intensity of Jim Sellers and the outstanding biological teamwork of the troika Gilgan-Milles-Patterson. Every week they came up with humorous multimedia-intros (filmstrip+cassette tape!) to the biology lab sessions, these guys were way ahead of their time! Yes, the opening years at Douglas remain something special in my life. And it didn’t take four decades to realize that. I became aware of it already when I moved on to another educational institution, high up on a hill. It went OK there for me too, but something wasn’t the same. I never quite found the intensity and lustre of the College years again. Douglas proved to be a hard act to follow. According to Goethe there is magic and bewitchment in every new beginning. This is surely one reason why many of the "original" students think so highly of their Douglas College experience. Four decades later one cannot reasonably expect any of that magic to be around still. But maybe some of the energy has helped to create that solid and inspired dedication to quality education . .